Everytime I walk pass any expensive watch shop that is retailing swiss-made brands, I tell myself “if only I could afford…”. That’s why we look for alternatives such as microbrands that quite often offer us a bargain deal that is comparable to those expensive well established brands, but we have to sacrifice the production country, the watch movement, the material used, etc. 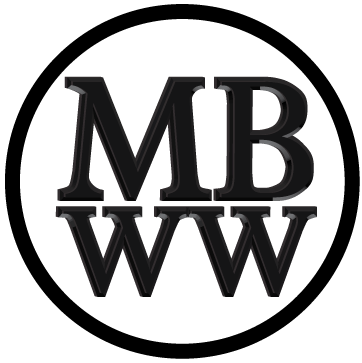 Well… that trend is about to change with new microbrand watches launching swiss made with swiss movement at a very affordable price through kickstarter or sometimes through pre-ordering via facebook or forums such as watchuseek (with enough interest gathered and massive online marketing). We can say, some of ’em were very successful in bringing top of the game materials at a very affordable price such as Stuckx The Rock, LIV Genesis, DWISS M2, Vilhelm Elemental and many others. 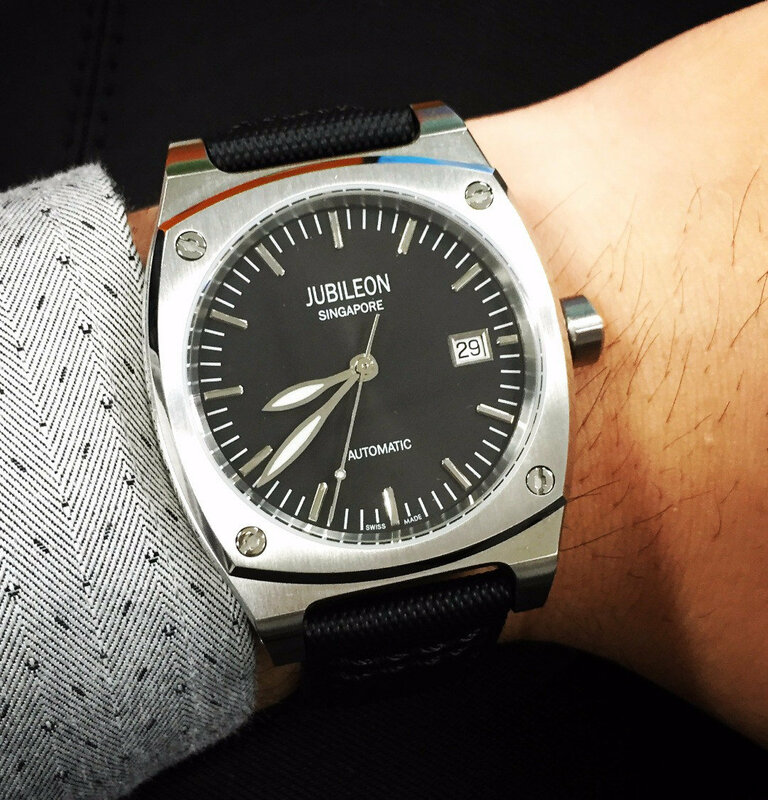 Today, adding into the list of affordable swiss-made watches, I present you, Jubileon a swiss made brand that originates from Singapore, a country that recently celebrated its’ 51st Birthday of Independence and founded by a true local Singaporean, Mr. Kum Chun Wai. The brand name was in honour of Singapore’s 50th Year of Independence in 2015, known as the Golden Jubilee. Thus, Jubileon was born ! Today, Jubileon have launched its’ 1st swiss-made model, SuperEllipse, on Kickstarter and is already half way towards its’ goal. The name of the watch is inspired by the superellipse curve, which is the mathematical representation of the cushion shape. Even though it’s a Singapore brand and locally designed as well, the swiss-made concept is due to the fact that it’s manufactured in Switzerland, using a swiss-made ETA-2824 movement and most importantly complying to all rules to have its’ dial stamped with a swiss made declaration. How cool is that? Let’s go through what’s the fuss about me writing this review for Jubileon Superellipse is all about… Trust me, it’s worth checking them out because not only they are a swiss-made watch, but the overall concept and design are 100% original from what’s being offered currently. Leaf-shaped minute and hour hands with Super-Luminova C1. 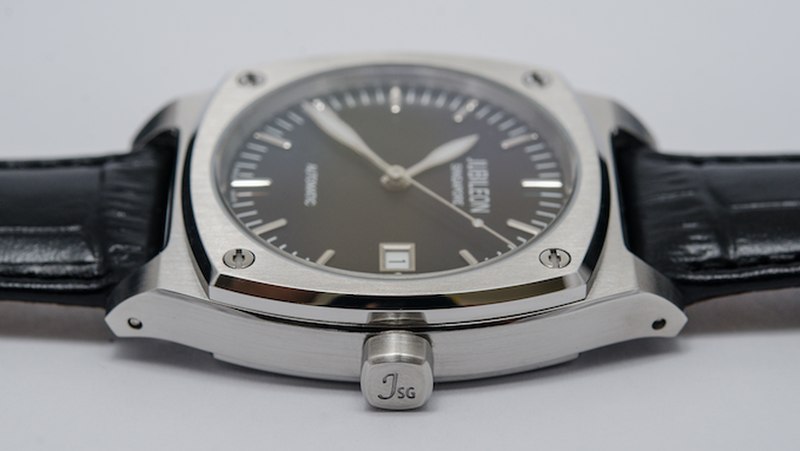 Dial Layout A (Singapore edition) – with ‘JUBILEON SINGAPORE’ on top and ‘AUTOMATIC’ below. This gives the dial a well-balanced feel. 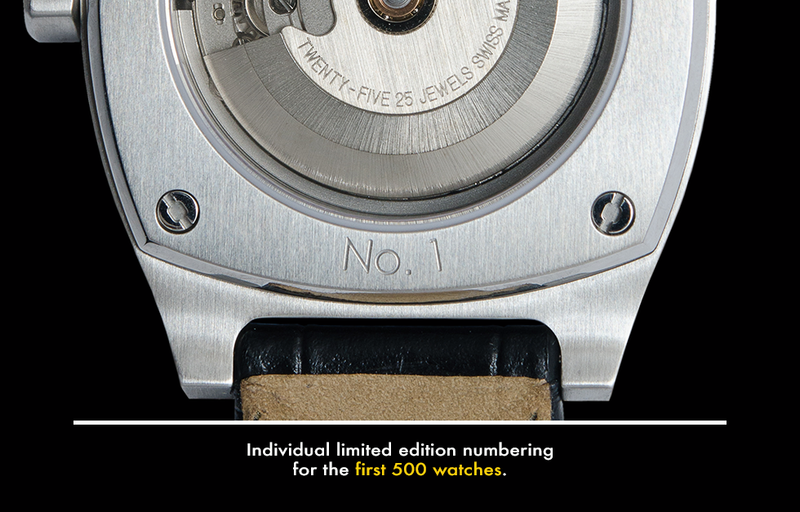 Dial Layout B (International edition) – with ‘JUBILEON AUTOMATIC’ on top and blank below. This is an alternate dial for backers who prefer not to have the word ‘SINGAPORE’ on the dial. 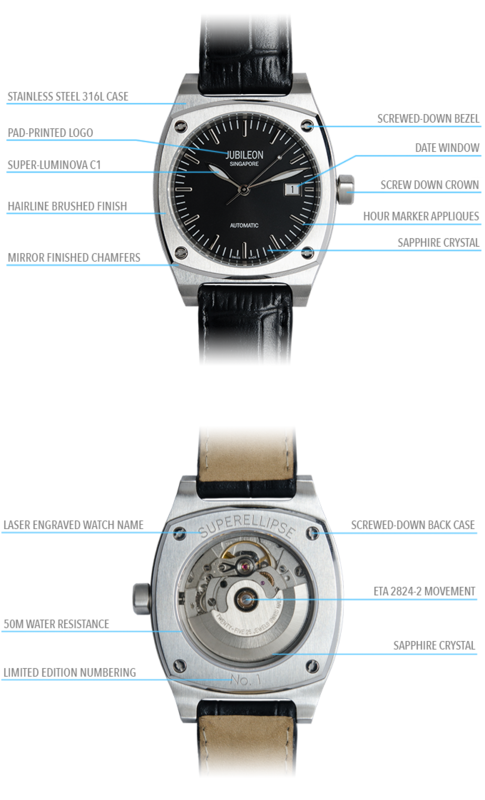 The case is a 3-component assembly comprising the bezel, body and caseback. Each piece is made of medical grade 316L stainless steel. To manufacture, each piece is first stamped outfrom a blank to get an approximate shape and then machined to the final form. Finally, the chamfers are expertly polished to achieve the scintillating mirror finish, while the remaining surfaces are carefully brushed to get the beautiful ‘hairline’ finish. The case has been meticulously designed, which is apparent from the many smooth contours on the case, such as the one joining the lugs to the side of the watch. With backgrounds in mechanical engineering, Jubileon make no secret of their love for screws, bolts and nuts. Naturally, rather than pressed-down, the bezel and the caseback are screwed down to the main body with four screws each. The screws, which have customised screw heads that are beautifully polished, also double as ornamental adornments to the four corners of the bezel and the caseback. The word ‘SUPERELLIPSE’ is laser-engraved on the top of the caseback, while the first 500 Superellipse watches additionally feature a limited edition running number (No. 1, No. 2, … , No. 500) at the bottom. 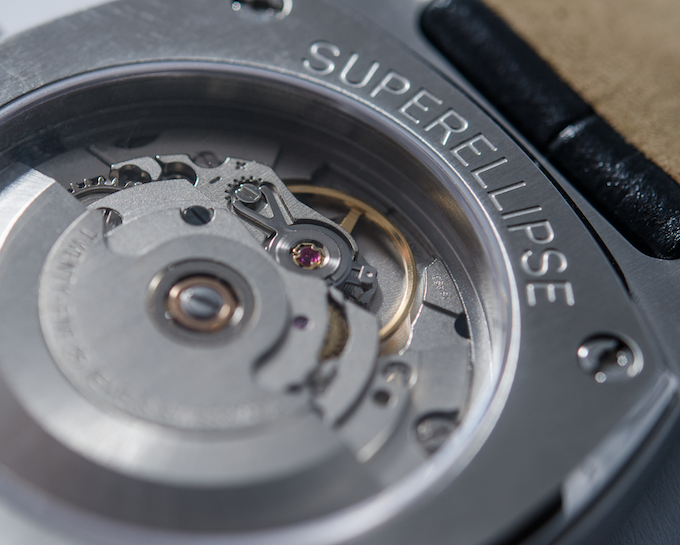 The heart of the Superellipse is the Swiss Made ETA 2824-2 movement. They chose ETA over other Swiss, Japanese and Chinese movements as ETA is one of the most trusted and established powerhouses in movement manufacturing. With a reliable workhorse powering every tick, Superellipse will be a trusted companion for many years to come. To conclude my review… for the available Early Birds Exclusive (AUD$615 / USD$470) which offers swiss-made quality, swiss ETA 2824 movement, individual numbered for 1st 500 pieces, free worldwide shipping… I feel if any watch lovers out there who wants to add another watch into his / her collection, then go to Jubileon’s Kickstarter campaign now and pledge yourself a SuperEllipse ! Ending this review with a latest picture by Jubileon with Marina Bay Sands as the background… beautifully shot I must say !